Yes, ugly Christmas jumpers are a thing but since when are ‘Christmas dresses’ a thing?! I initially wanted to do a post on my favourite ‘Ugly Christmas Jumpers’ but when I saw these Christmas dresses with Santa hats on them, I just HAD to include these in my post. I mean, wouldn’t it be cute to turn up to a Christmas party in a dress covered with Santa hats?! Here are a few of my favourite Christmas dresses and Christmas Jumpers. I actually like the style and colours of these dresses. 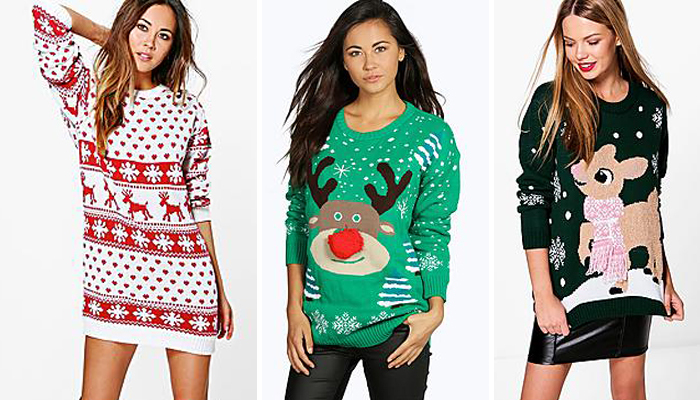 If you’re an ‘ugly Christmas jumper’ person, then you might actually like these. It’s very festive and would look great at a Christmas party, maybe? A bit different to your normal Christmas outfits but would definitely be cute and festive! Now of course who doesn’t like cute Christmas jumpers! I just had to include these because they are verrrry cute and VERY festive! I especially love the one in the middle! The colour and the reindeer pom pom nose is just too cute! What are some your favourite things to wear during this festive month?